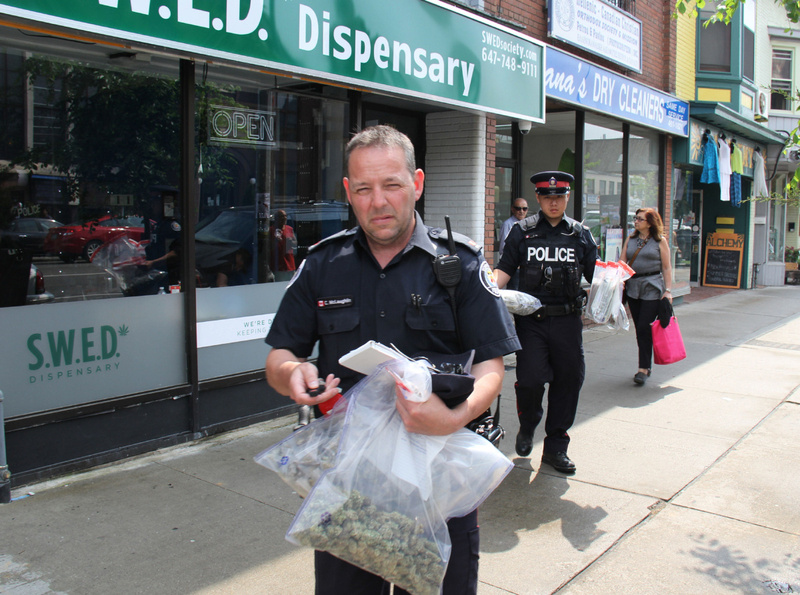 Just two days after cannabis was legalized across Canada, Toronto police say drug squad officers raided five marijuana dispensaries across the city Friday afternoon. “Just as before Oct. 17, we are enforcing the laws and we are continuing to do so. Anybody who remains open is to do so at their own risk,” spokesperson Gary Long told Global News Friday evening. Long said officers were enforcing provisions under the Cannabis Act. He said several people were charged and released. READ MORE: For the launch of our weekly newsletter Cannabis IQ. Under Ontario law, the provincial government’s online retailer, the Ontario Cannabis Store, is the only legal vendor for marijuana until April 1. At that time, the Ontario government will issue licences for private businesses to sell cannabis. The City of Toronto told Global News as of Thursday, there were 92 known marijuana dispensaries. A spokesperson said 56 closed on their own pending the issuance of licences, therefore leaving 36 illegal retail locations. Long did not elaborate on why the five specific locations, located on 66 Fort York Blvd., 333 Spadina Ave., 912 Danforth Ave., 1506 Dundas St. W. and 2655 Lawrence Ave. E., were chosen. Marijuana activist Marc Emery condemned the raids on Twitter Friday evening. “There are no legal shops in Toronto due for six months but Toronto police services want you to have no real access for half a year while pot is supposedly legal,” he wrote.